As the new year got underway, I was talking with a friend about my chosen word for 2018. She shared with me her word for the year: Accountable. Many people choose different things to help remind them of their word throughout the year. One idea I liked was creating a bangle with your word stamped onto it. One year I made a small paperweight that I kept on my desk in my office (where I needed it the most!) 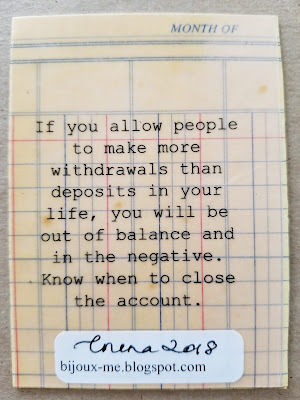 I thought I would make an "accountable" paperweight for my girlfriend, but when I could not find the blank paperweight, I decided to make her an ATC. 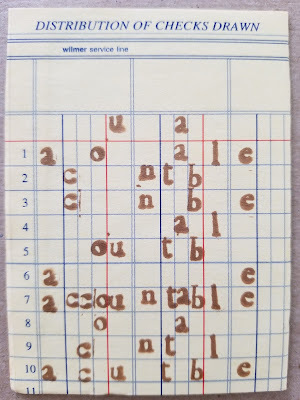 Accountable...the word brought to mind ledger paper (which I have plenty of!). then I thought about using the letters of the words in place of numbers that would normally be found on a ledger. The numbers in the different columns add up to the bottom line. 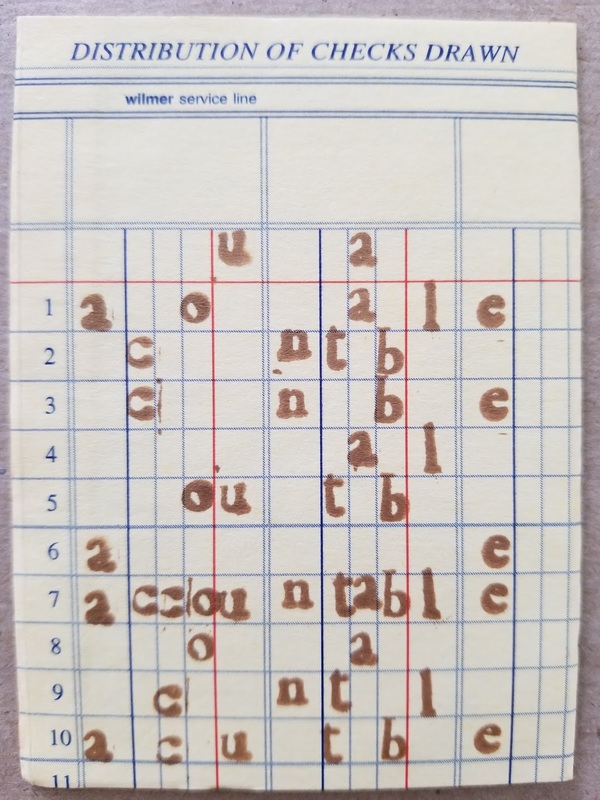 For my card, the letters add up to spell the word accountable. I looked for a quote on accountability, and when I found this quote, I knew that was the one. I typed the quote and ran it off on vellum. Since I have an inkjet printer, I needed to spray a fixative on the vellum so it wouldn't smudge. I adhered the vellum with spray glue. I just know that my girlfriend will be tickled when she receives this! 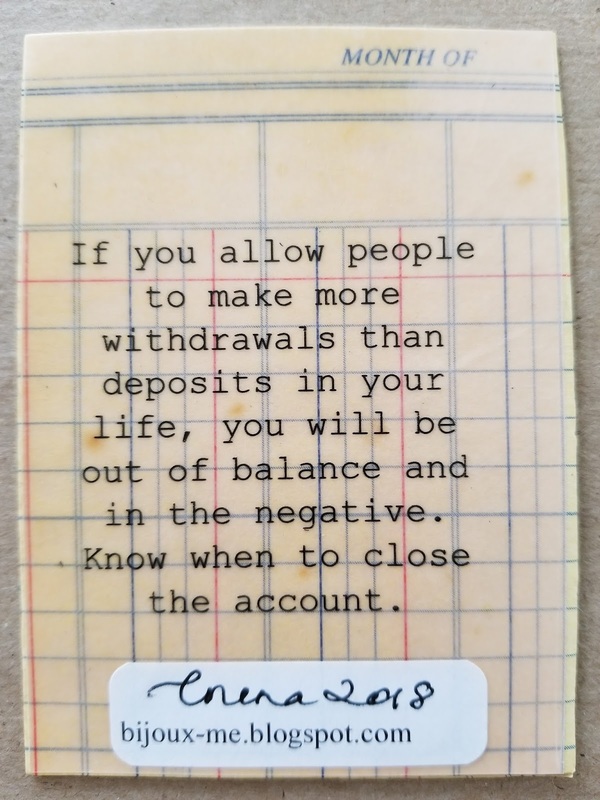 I love my accountable card! It is just what I need to help me stay. . . accountable! Such a special, thoughtful gift from a talented artist! Thank you so much Lorena, ma chere amie! I am so happy that you like it, Maria! I found your word for 2018 very inspiring!